Behind every great perfusion system is a reliable valve controller. By running experiments automatically, AutoMate Systems will leave you free to accomplish other tasks – saving you both time and money. The ValveBank® can store sixteen user programs with 10 millisecond switching accuracy. It includes powerful perfusion commands and capabilities not offered by competing valve drivers: open single or multiple valves, master channel for control/buffer solution, computer control. Designed for electrophysiology. CE marked for Europe. Control valves manually (by keypad) or by computer – simultaneously thanks to the microprocessor design. Optional BNC cables and 19” rack-mounting brackets. All AutoMate valve controllers switch 12V DC solenoid valves open and closed rapidly using full power, then hold-in at 1/2 power to prevent thermal transfer to your solutions. Low noise circuitry minimizes recording artifacts in electrophysiology. Both ValveBanks and AutoMate’s ValveLink controllers are designed for use with pClamp, SutterPatch, Patchmaster, AxoGraph, et al. All AutoMate products include a one-year limited warranty covering both parts and labor (see manual for more details). The ValveBank® remains the only programmable valve controller for physiology that does not require a computer. ValveBanks include digital and manual control, plus they can be programmed through their keypad and LCD screen or EasyCode® software from a Macintosh or PC. ValveBanks run user valve sequences without a computer and include eight programmable digital outputs for control of external devices such as stimulators, pumps and recording devices. 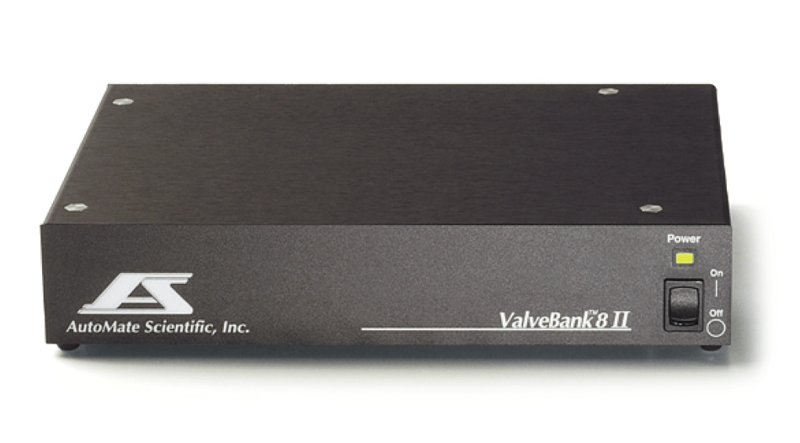 Entire ValveBank programs can even be triggered by a single TTL pulse. Digital inputs activate valves by computer or external devices including level sensors, flow meters, and UV/VIS detectors. Optional EasyCode software helps you program your ValveBank with a Macintosh or PC-Windows using easy “click-and-drag” time bars. Save and load unlimited programs to disk, print out program listings, then download your sequences into the ValveBank’s memory with the included serial cable in one simple step. Transfer and run programs on the ValveBank, which can be disconnected from the computer. ValveBank or ValveLink8.2: Which controller is right for you? 4 or 8 channels available. 8 digital in, 8 digital out, serial (RS-232). One pulse can start a ValveBank program, or TTL inputs each control 1 valve. 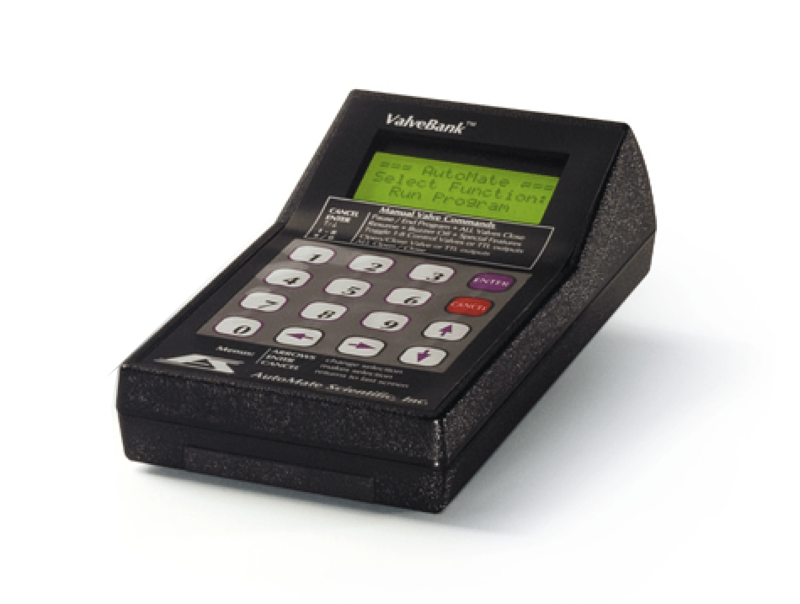 Yes – ValveBank keypad, EasyCode software or digital outputs from your data acquisition software. Mac and PC “EasyCode” software to pre-program ValveBanks (up to 16 ch.). 1-on, master channel, timed open, TTL outputs. 8 ch. each, USB network to 64 ch. 8 digital in, USB, analog input, event marker out. One TTL input per valve, or demultiplex and control up to 16 valves with 4 inputs. Only using real-time analog or digital outputs from your computer / data acquisition software. 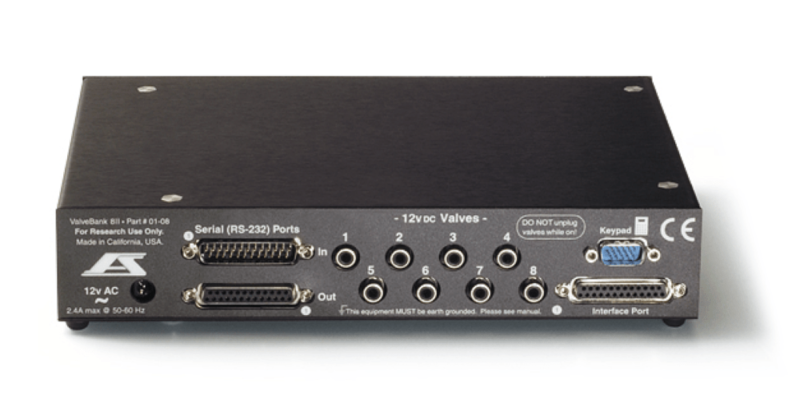 Free Windows XP real-time USB control and networking software for up to 64 valves at once. Up to 12 Watts (1 Amp) per channel, 24 Watts (2 A) total. Program up to sixteen channels of valves and digital outputs. 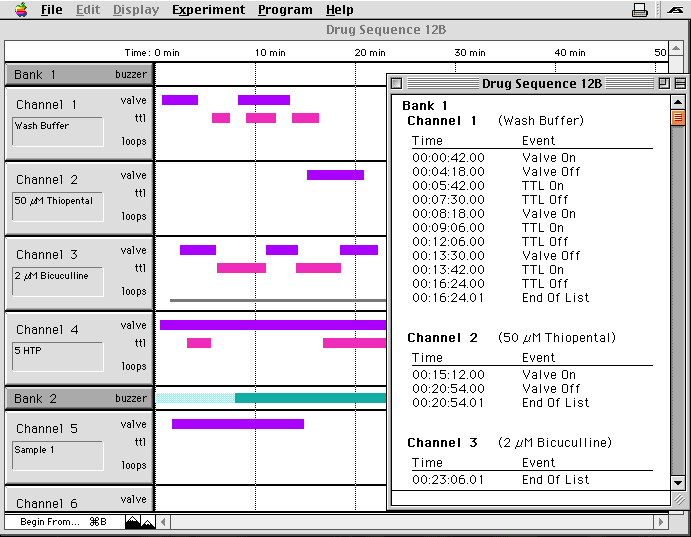 Open multiple experiment windows. List sequences to screen or printer. Copy and paste. Zoom in and out of your experiment.